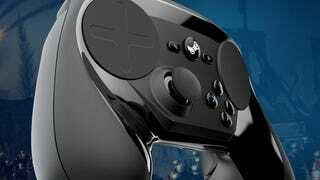 When Valve unveiled the first prong of their living room invasion, the Steam controller, it was unique, but also hella wonky. Since then, it's been through multiple revisions and overhauls. The result? Something not quite as good as a mouse-and-keyboard, but close. It was functional, but I didn't love it. As you can see, I clumsily stumbled through FPS Metro: Last Light like a toddler taking his first steps... in a warzone. It wasn't pretty. I felt much more in control here, which is a very good thing to say about, you know, a controller. Moreover, I was playing a faster game, the new Unreal Tournament, and I still managed to get into a not-totally-suicidal groove pretty quickly. The control stick definitely helped, given that it's a mode of movement I've been prepared for by years of play with Xbox and PlayStation pads. I only used one of the touchpads, the right one, but it still allowed for a degree of speed and accuracy I just don't get out of traditional controllers. I also felt much more able to grip the controller without fearing that I'd press down too hard on a touchpad. I was able to manhandle it a bit more, really feel the game—something I couldn't do with the more delicate version of the Steam controller I tried last year. I still had some trouble adjusting to the controller's mouse-like precision (not to mention a lack of auto-aim in-game), but I didn't feel overwhelmed or out of my depth. Rather, it was like I'd been struck by this lightning bolt of new power—potential to play better than ever before—and I was still coming to grips with it, shaking off the charred dust of my old clumsiness. In short, the new Steam controller felt like a halfway point between a traditional controller and a mouse-and-keyboard setup, which is exactly what it needs to be. I still have some reservations (it feels a bit too light, non-touchpad feedback/rumble could be better, the overall shape and feel are still kinda awkard), but I'm glad Valve put the time in to make this thing so much better. I dig it. I'm not sure if the Steam controller will be for everyone, but for PC gamers following the migration path to the living room, it's at least promising. You're reading Steamed, Kotaku's page dedicated to all things in and around Valve's stupidly popular PC gaming service. Games, culture, community creations, criticism, guides, videos—everything. If you've found anything cool/awful on Steam, send us an email to let us know.